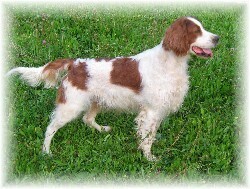 Our angels - irishredandwhitesetters Webseite! Bran came to Austria 1,5 years old, his carreer began earlier in UK and Ireland. He got a lot of Green Stars at Shows and had qualified for Crufts. 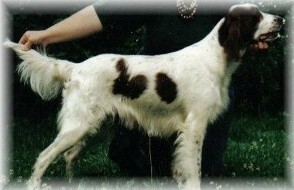 In 2001 he was "Top Sire" in Great Britain because of the quality of his puppies there. Bran has given his good health, powerness, the strong of his body and his beautiful head to his children. We are very thankful to live with him for such a long time, he was our "once in a lifetime-dog". He was all, what we looked for in this breed. Bran learned us a lot about the breed, he was a real "showbunny" in the ring, always ready to present himself, head high and the special expression in his eyes .... he was the handler and we learned to run in the ring .... Bran liked to go to shows, he knew by himself how to do to get an Excellent, very proud made us his win in Germany (Günzburg 2003) "Best of Show of more than 80 Setters". We visited a lot of european countries with him and found many doggy-friends there. I am very proud of his offsprings, they are nearly all over the world, not only in Austria and Europe, also in USA. A lot of them are x-rayed and have good health-checks, so he was also a wonderful studdog. Life with him was a great adventure, a true soul in the house and a little devil outside. He was - as Ronny Blomme said a few years ago about him - a strong boy with a nice character ! Katie was from a workingline from the Lough Erne Kennel from Ireland. Nearly her whole life she was in really good condition. 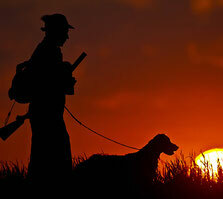 With great enthusiasmus she was retrieving, a true hunting compagnon for my husband. Katie loved to be with us and played with our children with great patience. She is behind all Mc Gillicuddy´s (G-litter - J-litter). Our O´Connor came from the wellknown Caispern-Kennel from Great Britain. She was the mom of our K - litter and gave her good huntinginstincts to her children. O´Connor had a lot of will to please and will to find birds. No bushes and no thorns could stop her, if she was on hunting-trip. She was very obedient and her retrieve was excellent, no rabbit and no fox was too heavy to pick up, no fitch and no marten could smell too strange for her.